Ooooooh!! I'm going to have fun with this one!! Lovely! It's perfect for my haunted neighborhood. Thanks so much! I'm not gonna do it, and you can't make me! Just my size and done in wonderful style. My sims will love this one! Thanks! ~Santa reading~ Yep! You were nice! Oh wait� that�s not you. love the victorian style thanx! Great work Christine! Your third feature, wow! Congratulations! DON`T TAKE CREDIT FOR MY WORK! You may use my work but please give proper credit. Beautiful work! I admire the accurate detailing of the house. You know, it isn't often that you come across a house like this! I love it! I love it, you are the bombdiggity. All other houses on this site just got OWNDIZZLED! Love it! You're good at that! Make more! 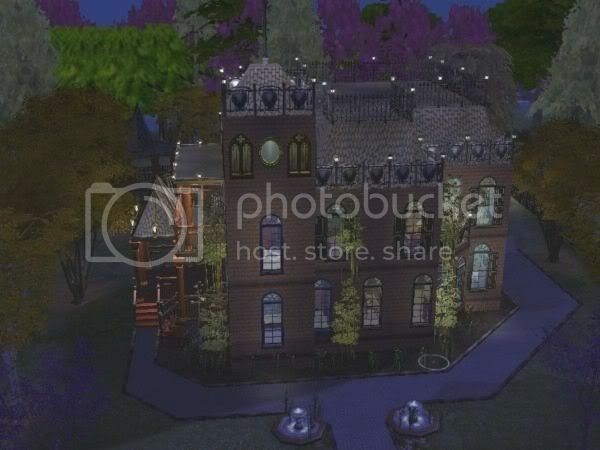 I downloaded the Adams Family sims & this is the purrrrrrr-fect house to put them in! Thanks so much & great work! it looks really beautiful, how did you do the roof though? But I don't have $186,000 Could I give you some cookies I just made instead?